IN March 2018, the United States slapped tariffs of 25 percent on steel imports and 10 percent on aluminum in the name of national security under Section 232 of the Trade Expansion Act of 1962. Then, the Office of the United States Trade Representative released a report on the investigation of China under Section 301 of the Trade Act of 1974, claiming China’s acts, policies, and practices regarding technology transfer, intellectual property, and innovation are “unreasonable and discriminatory, and burden U.S. commerce.” In early April, it issued a list of products imported from China subject to additional tariffs of 25 percent totaling US $50 billion. In June, Donald Trump approved the tariff imposition on US $50 billion worth of Chinese goods, officially starting from Chinese exports worth US $34 billion on July 6. The remaining US $16 billion was to be imposed later. 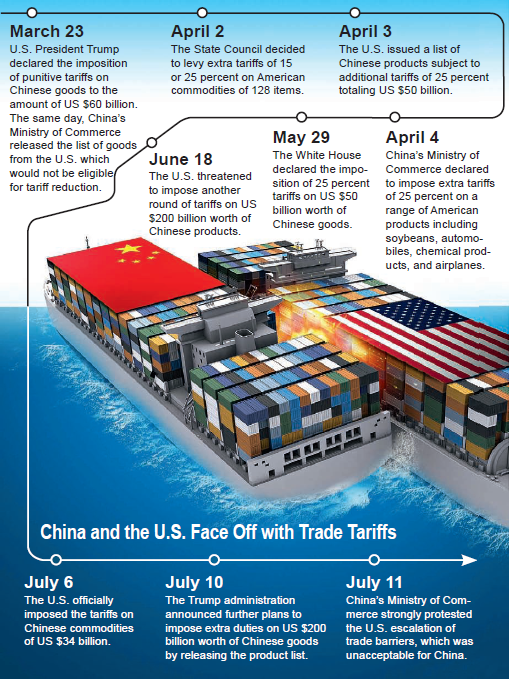 In July, the U.S. issued another trade barrier of 10 percent tariff on imports from China with a value of US $200 billion. On August 1, U.S. Trade Representative Robert Lighthizer said the barriers were suggested by President Trump, who ordered to increase the amount to 25 percent. As the U.S. continues to escalate trade tensions, China has been resolutely fighting back against the unilateralism, protectionism, and hegemonism based on international rules. Meanwhile, it acts as a responsible power by introducing more measures to open its door wider to the international community. China has been taking a fair and reasonable attitude when dealing with the U.S. investigations under Section 232 and 301. First, it has been willing to resolve the trade dispute through bilateral negotiations so that the spat will not hurt either side, but achieve mutually beneficial results. Second, China has made it clear that it will resolutely defend its national interests. Once the U.S. insisted on placing tariffs on Chinese goods, China would retaliate and resort to the World Trade Organization (WTO) dispute settlement process. Finally, when the U.S. did act against China, it fought back with a list of U.S. import goods subject to China’s tariff as well as a complaint filed to the WTO based on international rules. Meanwhile, China didn’t take the low road by disturbing the global trade order as freely as the U.S. had. Instead, it proactively introduced measures to further reform and continue opening-up for the benefit of the world. First, China eased restrictions on market access of foreign investment to the country to increase opportunities in more sectors. After four decades of reform and opening-up, foreign investors now have access to most of China’s manufacturing sectors with the bar left for those industries like shipbuilding and auto and aircraft making. As the competitiveness improves, it is also opening more service sectors to foreign investors. The latest negative list for foreign investment, which became effective from July 28, is shortened from the former 63 items to 48. Restrictions on investing in 22 sectors including banking, car making, railways, power grid, and gas stations were removed or loosened. For example, there is now no restriction on the proportion of shares held by foreigners in banking. The foreign share ceiling in securities, fund management firms, futures agents, and life insurance enterprises is increased to 51 percent. In 2021, all restrictions on foreign shares in the financial sector will be removed. As for auto making, foreign capital can now gain full access to investing in special-purpose vehicles and new-energy cars. The restrictions on commercial vehicles will be lifted in 2020. In another two years, the regulation that limits the proportion of foreign shares in joint ventures for making passenger vehicles will be abolished as well as the regulation that a foreign company can set up no more than two joint ventures producing the same kind of whole vehicles will also be removed. In the sectors of agriculture and natural resources, China now permits foreign capital to engage in mining graphite and smelting rare earth and tungsten. Second, China is working to improve its business environment to attract foreign investors. They include efforts in aligning with international prevailing trade rules and negotiations for a bilateral investment treaty between China and the European Union. China is also improving government transparency and laws and regulations, such as on intellectual property, through the practice of building pilot free trade zones. In April, China announced to build Hainan into another pilot free trade zone where trade, investment, and intellectual property practices and laws will be improved for a better investment environment. China launched antitrust actions to encourage competition and give full play to the market’s decisive role in allocating resources. In the institutional reform this year, the new State Administration for Market Regulation was established for integrated and effective law enforcement regarding antitrust cases. A guideline for this is also in the pipeline. Besides, local governments are introducing incentives for a better business environment. Third, China promised to strengthen intellectual property protection in response to foreign businesses’ major concerns. With a newly reshuffled State Intellectual Property Office, law enforcement against intellectual property infringement will be enhanced and the deterrence of consequent penalty for law breaking will be ensured. China also encourages technology exchanges and cooperation between Chinese and foreign firms and further protects the legitimate intellectual properties of foreign businesses in China. Last but not least, China is taking the initiative to expand imports by lowering tariffs on some imported goods. Beginning on July 1, China slashed tariffs on vehicles and auto parts. For car imports, the 25-percent tariff levied on 135 items and the 20-percent duty on four items have both been reduced to 15 percent. Import tariffs on 79 auto part items have been cut to 6 percent from the current levels of 8 percent, 10 percent, 15 percent, 20 percent, and 25 percent. In addition it promised to open the government procurement market for the 47 signatories of the WTO’s Agreement on Government Procurement. Besides, the first China International Import Expo is slated to take place this November in Shanghai as a platform for China to promote globalization and to provide the world with public goods. These measures of further reform and opening-up stand in pointed contrast with the U.S. actions impeding economic globalization. While developing itself, China is working to benefit the world. Such measures as broadening market access, improving the business environment, and protecting intellectual properties will attract investors from developed economies to share the dividends of China’s opening-up. Imports that need to be expanded include agricultural produce, oil and natural gas, cars, daily consumer goods, and high-tech products such as components used in capital- and technology-intensive industries. Exporters, from either developed economies or emerging ones, are able to share China’s market with their respective competitive products. In a nutshell, in dealing with the trade spat provoked by the U.S., China insists on defending its legitimate national interests and multilateral trade rules in a fair and reasonable manner. China didn’t and will not escalate the tension, but will firmly fight back against U.S. provocation. Its determination to further reform and open wider will not be compromised under the pressure from the U.S. An open Chinese market will benefit not only itself but also the entire world. China is acting as a responsible country. SU QINGYI is a senior research fellow and Deputy Head of the Department of International Trade at the Institute of World Economics and Politics with the Chinese Academy of Social Sciences.